In September 1654, twenty-three Jewish refugees from Recife, Brazil arrived in the Dutch colonial town of New Amsterdam aboard the St. Charles, a French warship. The Portuguese had just retaken Brazil from the Dutch, and these Jews feared living under the same repression that had caused their ancestors to flee Spain in 1492 and Portugal in 1497. Despite strong protests by Peter Stuyvesant, the local governor, the Dutch West India Company ordered that this small group be allowed to stay in New Amsterdam. At first calling themselves Shearith Jacob, or Remnant of Jacob, and later Shearith Israel, they became the first Jewish congregation in North America. For almost 175 years, Shearith Israel was the only Jewish congregation in New York City, and its history has been deeply intertwined with that of the city and the nation. Active in both the synagogue and the outside world have been such figures as Rev. Gershom Mendes Seixas, an incorporator of Columbia College and a prominent patriot during the American Revolution; Commodore Uriah Phillips Levy, a hero in the War of 1812 who later saved Thomas Jefferson's Monticello from ruin; Supreme Court Justice Benjamin Nathan Cardozo; Emma Lazarus, one of whose poems is inscribed on the base of the Statue of Liberty; and Maude Nathan, who was active in the women's suffrage movement as well as a Daughter of the American Revolution. 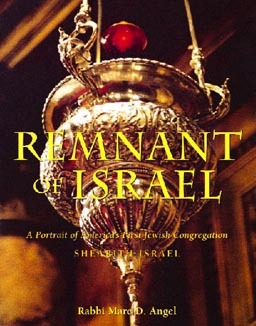 Published to mark Shearith Israel's 350th anniversary, this book tells their individual stories as well as the history of the congregation, explaining its origins, its rituals and its traditions. It is profusely illustrated with portraits, historical documents and ritual objects. There are beautiful views of the Little Synagogue, part of the present building on Central Park West at 70th Street, which incorporates furnishings from the congregation's 1730 synagogue on Mill Street, and of the recently restored main sanctuary, with its stained glass and interior design by Louis Comfort Tiffany. This book tells a fascinating story, one that will appeal to anyone interested in the history and culture of the Jewish people, of New York City, and of the United States. Dr. Marc D. Angel is Senior Rabbi of Congregation Shearith Israel, the historic Spanish and Portuguese Synagogue of New York City. He has served the congregation since 1969. Author and editor of twenty books and numerous articles, he has won the National Jewish Book Award in the category of Jewish Thought. His pioneering works on Sephardic history and culture have been highly acclaimed and well-received by scholars and general audiences alike. Rabbi Angel has been an active communal leader, serving as President of the Rabbinical Council of America, President and Honorary President of Sephardic House, Vice President of the American Sephardi Federation, and Chairman of the Rabbinic Advisory Committee of the Jewish National Fund. He has been a board member of the New York Federation of Jewish Philanthropies, the HealthCare Chaplaincy, Cancer Care and many other organizations. He is a recipient of the National Rabbinic Leadership Award of the Orthodox Union, the Bernard Revel Award of Yeshiva University for Religion and Religious Education, and the Finkle Prize of the New York Board of Rabbis. In 1992, he was awarded an honorary Doctor of Divinity Degree from Yeshiva University, where he earned undergraduate and graduate degrees as well as his rabbinic ordination. He also holds a Masters degree in English literature from the City College of New York. Rabbi Angel and his wife Gilda have three children and four grandchildren.